Hey did you guys know I liked MR2's? My first true car love affair was with a 1986 MR2 with only 58k miles on it. It was amazing and a total hoot to drive, but ultimately I didn’t want to spend $1,000 to move my $4,000 down the east coast when I moved to North Carolina. Plus there’s the whole boy meets sportscar, boy starts a family saga. “There will be others” I told myself. I’ve been here a year now and the garage is MR2-less still. I should have kept that car. 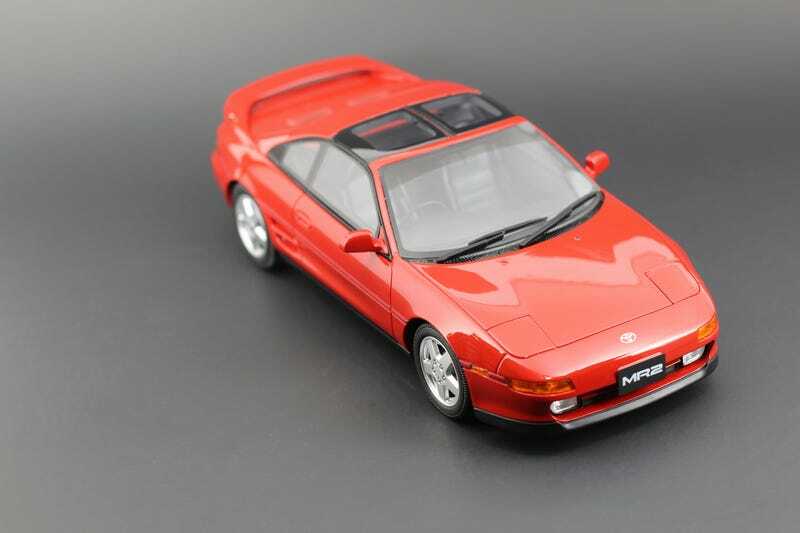 What makes me more sad though is the complete lack of AW11 MR2's in the land of 1/18's. All the JDM fan boi’s are swooning over their endless Skyline and Supra models, and even the damn Miata had a model built by Kyosho at one point. The next best thing for me would be to get the second generation MR2, or the SW20 for you nerds. Guess what though? There aren’t many 1/18's of those either! Peako models makes a brilliant resin model in 1/18 scale, but I’ve literally seen real, running MR2's on Craigslist for what those cost. All that changed when Ottomobile announced their March Pre-order cars. I saw this red beauty and immediately added it to cart. Good thing I did too, because there were only 1500 models being made and they all quickly sold out! The second generation of the MR2 launched in Japan in 1989, and then reached North American shores in 1990. The Ottomobile model itself is of a 1992 JDM Turbo car. The 2.0L 3S-GTE engine pumped out 218hp, and even though Toyota brought in Dan Gurney to help with the handling, the car proved to be more than a handful for inexperienced drivers. Snap-oversteer and MR2 Turbo are mentioned in the same sentence so often, its almost cliche. Toyota made updates to the suspension, wider tires, and the power steering of the car to lessen the risk. This car is a quintessential 90's sports car. Pop-up headlights, T-Tops, red paint, and the engine behind the driver. I absolutely love it and will totally have the 1:1 in my garage some day.